You are here: Home / News / Announcements / Quartetting…..for Life ! Take a look at this photo. You old timers will recognize those faces in no time. You youngsters may not have a clue. Undoubtedly there is a lot of history represented here…but it goes way beyond that. This picture and the men in it represent a historical legacy that may not ever be repeated in the annals of Barbershop singing. Let’s take a closer look starting clockwise from twelve o’clock. Most of you will recognize the smiling face of Jack Baird. Jack began quartetting back in Nebraska and didn’t stop until he passed away. Jack sang baritone in two district quartet champions, the Close Harmony Committee in 1972 and his first gold with the Barbersharps way back in 1966. Over at three o’clock we have Tom Parish, a long time quartet man from Chicago’s North Shore chapter. Tom won his championship with the Gold Coast Four at my very first district convention in 1964. Down at six o’clock, holding up the bass section, is Tom Watts. Tom, a district past president and international officer, found barbershop sing during a visit to California and kept it up for the rest of his life. Let’s finish our trip around the clock with a stop at nine o’clock and a quartet mate of Tom’s, Billy McKnight. 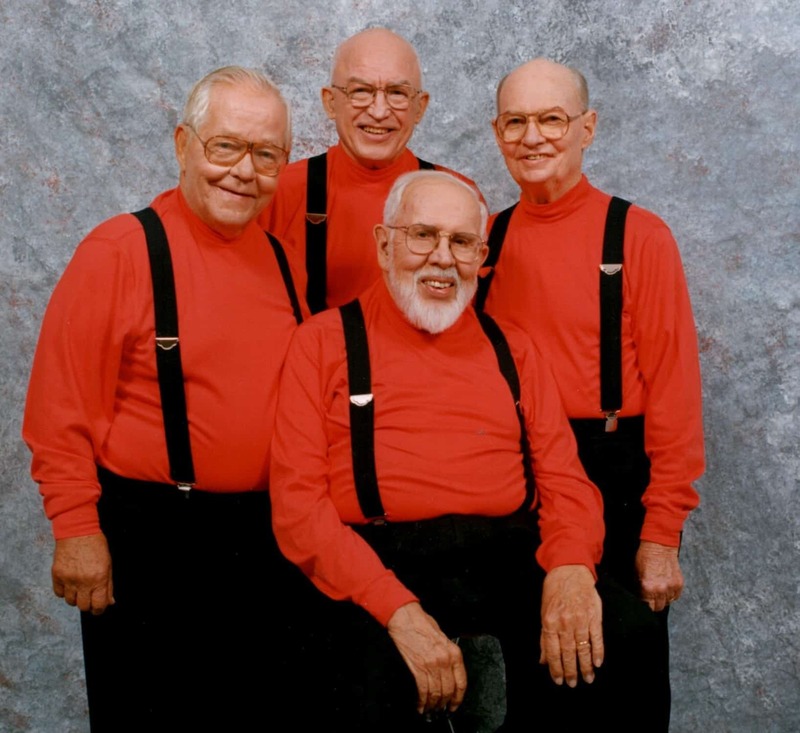 Both Billy and Tom sang together in one of our district’s most entertaining quartets, the Barber-Q-Four. Billy was only a teenager at the time and the BBQ4 won their district championship way back in 1949. You may be asking yourselves, what’s so special about four old timers in a quartet picture? Well, if you’ve done the math you may have noticed that the date on that picture of the “Forever Four” is from the Fall District quartet contest of 2002. Jack Baird won his first championship 38 years earlier. Tom Parish a mere 36 years prior. Tom Watts and Bill McKnight won their only championship 53 years before that 2002 contest! An amazing feat for any one person, let alone four in the same quartet. Bottom line: Attitudes, outlooks and voices change over the years. There’s no denying that. But what Tom, Jack, Bill and Tom have shown all of us is that we really are never too old not to sing in a quartet. What a legacy these four men have provided for us in this one picture. I have a feeling that Jack Baird would tell me that there’s an Attacks & Releases article in what I’ve just said there somewhere. Think about it. A legacy of Quartetting For Life.